Do you remember rushing to get rid of our point-and-shoots when your smartphone camera started to improve? Most people did. A few years later, however, something interesting started to happen. The point-and-shoot camera came back into vogue. It seems we eventually realized that smartphones just aren’t as versatile as cameras, especially when you’re dealing with subpar lighting, fast-paced action, or a faraway subject. Nikon’s COOLPIX line is one of the most enduring entries in the point-and-shoot market. The first COOLPIX camera debuted way back in 2004. They’re still designing new models to this day. We’ve put together this list of the six best COOLPIX cameras to help you decide which one is best for you. In the market for a durable, powerful point-and-shoot? You can’t go wrong with one of these. 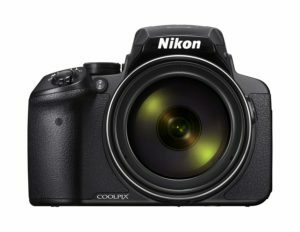 Most COOLPIX cameras are quite similar in terms of size and image quality. However, they can differ vastly in other areas, including lens quality, included accessories, and zoom capabilities. If this is your first camera, choosing between so many options can feel intimidating and overwhelming. Fortunately, it’s a lot easier to make a decision if you’ve spent some time thinking about the photos you like to take, the places you want to take your camera, and the ways you want to use your photos. Read on to determine which features and fixtures are essential to you! Do you like tucking your camera into your pocket, keeping it secure in a backpack, or wearing it looped around your neck? Your preference should dictate the size and weight of the point-and-shoot camera that you choose. Ask yourself: will it be convenient for me to take this camera on a long hike? Will it fit in my suitcase for our next vacation? Remember that the best camera for you isn’t necessarily the most powerful, advanced, and sophisticated camera on the market. It’s the camera that you’ll use every day. Put your needs and preferences first, and you’ll never waste your money. When shopping for the perfect DSLR lens, focal length is usually the very first specification that you consider. Finding the right point-and-shoot body is no different. Remember, you won’t be able to swap lenses. With a point-and-shoot, it’s critical that you find the focal length and zoom range that works for your needs. Most COOLPIX cameras have zoom lenses, which are great for testing out a variety of perspectives and compositions. Camera descriptions generally list the camera’s zoom capabilities, but should also give their rough equivalency to a full-frame focal length. Rather than focusing on how many times a camera can zoom, think about the focal range that it covers. Compare that to the type of photography you want to explore. Want to take beautiful, intimate portraits of your friends and family? Consider a point-and-shoot camera that covers the 100-200mm range. This can be hard to find. However, a few of those COOLPIX cameras are on this list These longer focal lengths compress perspective. That is flattering for the human face, while also allowing you to remain a comfortable distance away from your subject during the shoot. Prefer spending time in the great outdoors? You’ll probably want to opt for a camera in the 20-50mm range. Stay lower for beautiful wide-angle panoramas. You can also choose a longer focal length for close-up shots of wildlife, plants, and skies. If you’re aiming to shoot street photography, you should generally look for focal ranges between 24 and 35mm. This is close to the normal focal length of the human eye. That makes images appear strikingly natural and genuine. The pros know that it’s always important to have a clear view of your subject. Almost all point-and-shoot cameras incorporate an articulated LCD viewfinder. That enables you to quickly check your focus and composition before snapping a shot. However, the visibility of these screens can suffer in direct sun or other bright light. Some point-and-shoot cameras have solved this problem by adding an electronic viewfinder (EVF) like the ones you might find on a DSLR. Adjusting to an EVF can take a while, especially if you have never used one before, but it’s well worth the effort. A few cameras on this list have both an LCD screen and a live viewfinder. While this gives you the best of both worlds, toggling between the two can be a hassle. Supporting separate view-finding mechanisms can take a serious toll on your camera’s battery life. Once upon a time, the number of megapixels was the first—and last—question that everyone asked before investing in a camera. That simply shouldn’t be the case anymore, especially when you’re buying a basic point-and-shoot. Of course, there was a huge difference between the 2MP compact cameras of the 90s and the 16MP SLRs that put them to shame. These days, when even the cheapest cameras start at 10 megapixels, the size of your camera’s sensor is a much more crucial factor. It’s quite difficult for the naked eye to tell the difference between an image snapped on a 12MP camera and a 15MP one, especially since most of us don’t blow our images up to the size of our kitchen table. We’ve chosen six modern, feature-rich COOLPIX cameras with sizable sensors that document plenty of color and detail. Robust image stabilization and vibration reduction systems used to be reserved for expensive DSLRs. However, that is no longer the case! Quite a few models in the COOLPIX line offer this increasingly indispensable feature. Remember that the further a camera zooms, the shakier and softer its focus becomes. Now that point-and-shoots are capable of magnifying your shoots to an astonishing degree, it’s more important than ever that they come equipped with a dependable stabilization system. So if you’re looking for incredible zoom capabilities, be sure to stay on the lookout for cameras with a solid VR function. Let’s be honest: most of us wouldn’t be taking cool photos if we couldn’t share them with our friends and family, usually through social media, email, or text message. Remember downloading photos off your SD card, moving it onto your desktop, and then waiting a few hours while your photos uploaded to Facebook? Thanks to the range of wireless connectivity features available, we can now say goodbye to that agonizing process. Many point-and-shoot cameras incorporate features like NFC and Wi-Fi photo sharing. NFC, which stands for “near-field communication,” is a specialized technology. It allows you to transfer photos between devices simply by bringing them close to each other. Wi-Fi photo sharing is even more effortless. It enables you to upload images to your computer’s hard drive or even directly onto your social media accounts. Many people purchase point-and-shoots to use during vacations or family functions. For this reason, manufacturers frequently prioritize battery life in their compact camera designs. You can generally expect to squeeze 200-400 shots out of a point-and-shoot. However, that number can vary depending on how you use your camera. Buying a newer and more advanced model entails a bit of a trade-off: you’ll usually receive a larger battery pack, but advanced features—like LCD screens and vibration reduction systems—can drain your battery quickly. Be sure to check a camera’s official specs, and read a few user reviews, before you make a commitment. Should I choose a point-and-shoot camera over a DSLR? This is a fantastic question. Not everyone starts out with a top-of-the-line full frame camera. In fact, some famous photographers discovered their love of the art while shooting on a cheap, disposable film camera. Every photographer will tell you that great minds, not great cameras, produce beautiful images. However, you can’t deny that DSLRs offer lots of features that a point-and-shoot simply cannot. A point-and-shoot is probably the better choice if you’re just starting to explore photography, or if you want to take some nice photos without having to worry about your ISO settings, aperture, and white balance. If you want to keep learning more about photography—whether by experimenting on your own, taking a class, or delving into the literature—then a DSLR is definitely the safest bet. These powerful cameras give you the flexibility to expand your lens kit, explore exciting new techniques, and push the limits of your abilities. Will this camera actually zoom as far as it claims to be able to? In most cases, it will, although the quality of your images will probably suffer. Many modern point-and-shoot cameras can achieve ludicrous zoom ranges because they rely on smaller sensors and place the lens in a closer proximity to the sensor. So while you’ll be able to magnify your images by fifty or even eighty times, you’ll probably notice vignettes, feathering, and other image distortions that a DSLR’s lens would handily eliminate. The fact that your camera has insane zoom doesn’t mean that you’re obligated to take advantage of its entire range. Keeping things simple is often the best strategy. Should I buy any accessories? Of course, this all depends on personal preference…but why not? Spending less on your camera means you’ll have more wiggle room for awesome accessories. Love taking family portraits? Invest in a sturdy tripod made specifically for point-and-shoot cameras. Headed on a Caribbean vacation, but not ready to spring for a waterproof model? Shop around for cool underwater casings or pouches to keep your camera snug and dry. Ready to get experimental? You can find dozens of colored filters, flash diffusers, and other funky accessories to set your snapshots apart from the crowd. What’s the difference between optical zoom and dynamic zoom? This is another question that frequently perplexes newcomers, especially because those terms aren’t used much outside point-and-shoot spec lists. Optical zoom describes how much magnification a camera can achieve by physically moving its lens mechanism. Dynamic (often called “fine zoom”) refers to a totally digital magnification process; it’s basically the same as cropping your image after you pop it into Photoshop. Be cautious when a camera advertises amazing zoom capabilities: while dynamic zoom can be helpful in extreme situations, optical zoom achieves its results without harming image quality. That’s the factor that actually matters. Hopefully you now have a better idea of what you’re looking for in your next point-and-shoot camera. 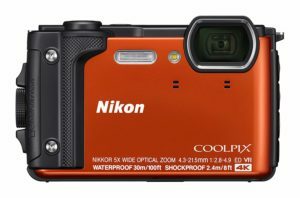 To help make your decision even more painless, here’s our list of the six best Nikon COOLPIX cameras on the market today. The COOLPIX line boasts some fantastic variety, from sophisticated videography machines to rough-and-ready snapshot machines. Dimensions: 10 x 5 x 5 in. Click to See Price: Nikon COOLPIX B700 4K Consistently rated one of the best point-and-shoot cameras on the market, the exceptional B700 mimics the best features of Nikon’s high-end DSLRs without the painful price tag. At first glance, the B700 lags behind the P900, its closest relative and most compelling rival. After all, this model has a more limited ISO range, and is missing a built-in GPS feature. It also doesn’t command the same incredible zoom range. It’s a solid machine on paper, but doesn’t have the same flashy features as its closest relative. Dig a little deeper, however, and you’ll discover that this camera is a budding videographer’s dream. For starters, the COOLPIX B700 boasts a robust, powerful 20.2MP CMOS sensor. It produces crisp still images and crystalline, 4K ultra high definition video. Set it to 30p or 25p to capture exactly the type of footage you want. Advanced 5-axis vibration reduction technology, combined with face-priority autofocus and a stereo zoom microphone, delivers cinema-worthy reels in any lighting. The B700 even supports RAW images, a feature not many point-and-shoots can claim. This definitely isn’t your grandma’s vacation camera. Reviewers loved the tech-savvy features that come standard on the B700, including the 3-inch Vari-angle LCD and the accessible DSLR-style design. They reported that this camera’s autofocus is fast and precise, that its zoom is silky smooth, and that its image stabilization is unparalleled among other comparably priced point-and-shoot cameras. Many reviewers were shocked at the image quality that the B700 can produce, raving about the richness of its bokeh and the clarity of its low-lit shots. Since the B700 approaches DSLR-level functionality in many areas, it’s even more disappointing when it falls short. There’s no hot shoe or external battery charger, and its menu system is labyrinthine at best. There’s also the ever-important issue of image quality and clarity, and the B700 doesn’t always deliver. After you push past 600 ISO, expect the amount of detail in dark blacks and bright whites to drop off dramatically. Sometimes there’s a bit of softness and blowout around the edges of a shot, which you may not notice until you pull the images up on a computer. Dimensions: 5.5 x 5.4 x 4.1 in. Click to See Price: Nikon COOLPIX P900 Many inexpensive cameras leave you locked into a subpar fixed focal length or fumbling with a clunky kit zoom lens. Fortunately for every budget-conscious photographer, the COOLPIX P900 is no ordinary inexpensive camera. By most metrics, it’s one of the most sophisticated and powerful compact cameras on the market right now. In fact, one of this camera’s most distinctive assets is its astonishing zoom capabilities. An 83x optical zoom, enhanced further by a 4x digital zoom and a 166x dynamic fine zoom, lets you put subjects into sharp and stunning focus. 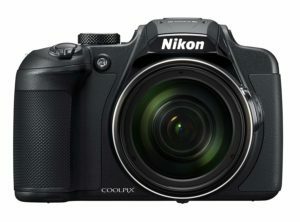 Like many of Nikon’s other high-performance COOLPIX models, the P900 is styled after a classic DSLR. That means a hefty and ergonomic frame, a durable grip fixture, a wonderfully crisp electronic viewfinder, and plenty of comfortable, user-friendly controls. Its Vari-angle LCD display gives you an intimate view of your subjects, while a 1/2.3 inch, 16MP CMOS sensor handles full HD video with aplomb. Even more impressive, its dual detect optical VR system—which is highly unusual in a point-and-shoot camera—keeps your shots smooth and stable no matter what. Although the P900 is designed with advanced users in mind, it does an excellent job remaining accessible to everyone. This camera is just as easy to learn and use as a standard point-and-shoot, while delivering much more sophisticated results. Regardless of their final opinion, every reviewer was blown away by the P900’s amazing zoom capabilities. They were also pleased with how easy its built-in Wi-Fi and NFC system made sharing and uploading their photos. The variety of autofocus modes—including contrast detect, multi-area, center, selective single-point, tracking, and single—allowed them to fine-tune their approach to perfectly suit the shoot. However, many reviewers were disappointed to discover that the white balance sometimes vacillates wildly from shot to shot, giving you true-to-life colors in one image and washed-out blur when the light changes. The P900’s shutter delay is quite noticeable, especially when you’re shooting at a high resolution or coming out of burst mode. A lag of a few milliseconds doesn’t sound significant on paper, but can mean the difference between the perfect shot and a blur. Although Nikon claims that the P900 can handle over 300 shots on a single charge, you shouldn’t expect that kind of battery life from normal use. Both the LCD Vari-angle display and the zoom will drain the battery in no time at all, so make sure you plan ahead and buy a few extra. Dimensions: 6.1 x 5 x 5.8 in. 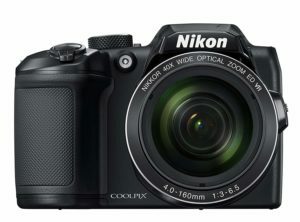 Click to See Price: Nikon COOLPIX B500 If the robust zoom capabilities and rugged DSLR-style construction of the P900 appeals to you, but the hefty price tag doesn’t, you’ll want to add the COOLPIX B500 to your wish list. It has the same excellent Nikkor glass for beautifully crisp, delightfully colorful photos no matter your subject. The B500 boasts an impressive 40x optical zoom lens, with an additional 80x dynamic zoom added on top. It also has many of the same features and fixtures as the P900, including a flip-up LCD screen, a smooth lens-shift vibration reduction system, and a comfortable, ergonomic grip. It shares many features with the first two cameras on this list, including a 921k-dot tilting LCD screen, an advanced lens-shift vibration reduction system, and seamless integration with Nikon’s Snapbridge mobile application. Most reviewers bought the B500 to replace a smartphone camera or an older point-and-shoot, and they praise it for its familiar design and out-of-the-box usability. They reported that its menus were easy to navigate, its fixtures were easy to control, and its automatic modes did a excellent job of balancing light and keeping subjects in focus. Because of this issue, the B500 often struggles to lock focus. This flaw is especially obvious in low lighting, and it sometimes cranks out blurry and dim images. It can take several seconds to locate the intended subject, then another few to isolate the focus. The main lesson to learn is that you shouldn’t depend on the B500 for sports shots, action or anything involving children or animals. Unfortunately, it’s just not nimble or smart enough to keep pace with a fast-moving subject. 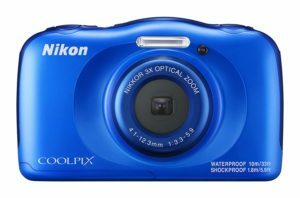 Click to See Price: Nikon COOLPIX W300 Waterproof Camera Now for something completely different: an inexpensive, awesome waterproof camera. The COOLPIX W300 isn’t just one of the coolest point-and-shoot cameras out there. It’s also routinely named one of the best waterproof outdoor cameras on the market, beating out much more expensive options. If you’ve ever daydreamed about snapping vibrant shots of underwater creatures, then the W300 is the point-and-shoot camera for you. The W300 is totally functional to 30 meters underwater, freezeproof to 14 degrees Fahrenheit, and shockproof to drops of eight feet. No matter the conditions, a 5x optical zoom and an impressive vibration reduction system keep your shots stable and smooth. Its 16MP, 1/2.3 inch sensor isn’t the biggest on the market, but that’s the price you pay for the other high-tech features. The W300 is still perfectly capable of producing clear 4K video and crisp stills everywhere you go. Although the W300 looks a little unimpressive on paper, reviewers were routinely amazed by how well it performed in the field. Unlike most cameras that claim a wealth of techie features, the W300 genuinely delivers. Its GPS feature lives up to its claims and performs beautifully in the field. Reviewers appreciated that they could stay in the know with a real-time altimeter and underwater depth gauge, or track their voyages with an interactive world map. The W300 successfully casts off the clunky, unattractive vibe traditionally associated with waterproof cameras: it features a sleek but rugged exterior and comes in a variety of lively colors, including orange, red, and yellow. The W300 offers the standard Snapbridge photo sharing feature, but it doesn’t work as smoothly as some of the other models on this list. Uploading images to the app sometimes takes hours, and navigating through the menus is frustrating at best. Some reviewers also mentioned that its battery life fell short of their expectations, often managing only a few hundred photos or several sizable videos before needing to be recharged. Even in good lighting, this model sometimes struggles to maintain focus or find the correct ISO. Keep in mind that the W300 is a highly specialized camera optimized for extreme shooting situations. If you don’t intend to use it in the water or snow, then you might be better off with a more powerful model. Dimensions: 6.8 x 3.6 x 5.2 in. Click to See Price: Nikon COOLPIX A900 Portable and understated, the Nikon COOLPIX A900 lets you pack light while taking advantage of the brand’s most advanced fixtures and features. A 35x optical zoom and powerful 70x dynamic fine zoom bring your subjects into view, while a 20MP 1/2.3-inch BSI CMOS sensor tracks subtle gradations in light, shadow, and color. A worthy inheritor of Nikon’s “Slim Zoom” title, the A900 is just a few inches wide and has an articulating LCD screen that tucks neatly into its side. It’s lightweight, portable, and slim. When handled correctly, however, it’s capable of delivering results that are indistinguishable from much more expensive cameras. With a broad 4.3 to 151mm focal range, it’s perfect for a close-up portrait, a wide landscape, or a quick snapshot at your child’s next birthday party. Take this pocket marvel out for a spin, and you might discover your new favorite companion. Reviewers enjoyed the A900’s compact design, reporting that it slides into a purse or pocket without adding much bulk or weight. However, several reviewers did mention that the A900 often struggles to pinpoint subjects or follow faces in a busy scene. Since most point-and-shoot buyers want a camera that can keep up with their fast-paced life, those few extra seconds can feel like an eternity. It might not seem like a huge issue until you’re racing to frame a shot—but then you’ll certainly take notice. As many reviewers have mentioned, the A900 has one big flaw: its internal image stabilization system can’t keep up with the length of its zoom range. Even if you balance the camera on a tripod, you’ll rarely manage a clear shot when it is zoomed in close to your subject. There are a few small hardware issues to mention as well. The pop-up flash and wristband both feel a little flimsy, so you’ll want to treat both with caution. While the LCD screen is articulated, it snaps into place rather than sliding smoothly, which often makes it impossible to avoid glare and find the perfect position. Dimensions: 6.38 x 2.6 x 5.98 in. 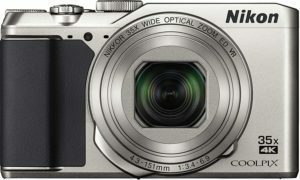 Click to See Price: Nikon COOLPIX W100 This rough-and-ready entry in the COOLPIX line has been around for a few years, but its funky space-age design and solid technical specs still hold appeal. An early ancestor of the rugged W300, this model can put newer models through their paces. A 13.2MP CMOS sensor, complemented by 3x optical zoom and a 6x dynamic fine zoom, gives you the flexibility to choose any subject. It’s waterproof to the same depth as the W300, and is dustproof, freezeproof to 14 degrees, and shockproof to a height of nearly six feet, making it tough enough to tag along on all of your most ambitious adventures. Since the W100 is a few years older and a few megapixels shorter than the other models on this list, you can usually find it for a much more affordable price. Compact yet still surprisingly powerful, it’s an awesome addition to your next backpacking photog trip, low-key beach adventure, or overseas voyage. Reviewers reported that the W100 worked exactly as advertised. It stood up to the toughest conditions and produced clear, colorful photos of any subject. The W100 also got high points for user-friendliness. According to buyers, its straightforward menus are easy to use. Its sleek, ergonomic body design fits comfortably into your hand. Lightweight and portable, it doesn’t even add much bulk to a backpack or purse. Reviewers also appreciated the 2.7-inch LCD screen, which is clear, brightly lit, and easy to see underwater or in daylight. Although charging the battery can be a little awkward—since the waterproof design means it can’t be removed from the camera body—the battery life is long enough to last for an extended hike or even a scuba dive. While this camera is a great replacement for your smartphone—especially during an exotic vacation—it won’t be great for a beginning photographer who wants to experiment with their new hobby. Like most inexpensive point-and-shoot cameras, the W100 doesn’t have full manual mode. That is sure to become an issue if you’re interested in experimenting with new styles and techniques. If you’re simply after a camera that’s easy to use and quick to boot, however, this might be just your ticket. The pop-up flash is useful in certain circumstances. However, it usually throws the white balance way out of proportion. Use it if you must, but be prepared for washed out whites, dimmed colors, and muddy blacks.